Review: Have you ever had a big secret that if it got out would ruin your whole social life? In Red by Alison Cherry, Felicity does. But somehow someone gets to know Felicity's secret. Will this person spread the secret? 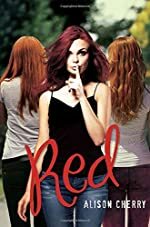 Red is about a girl named Felicity and her big secret that she relies on for a pageant coming up at school. But a blackmailer one day gives her a note that might change everything. Filled with mystery and suspense this book is a page-turner. I recommend this book for ages 12 and up because it uses some strong words and it might be hard for a kid to read. Red is a great book for a girl or a boy. There are hard words throughout the book but there not super challenging. It is also a long book that is great for after school reading. I recommend this book to anyone who is twelve and up because it does have strong words but overall an amazing book. We would like to thank Random House for providing a copy of Red for this review. Have you read Red? How would you rate it?